тема собирательная. Буду информировать о выходе обновлений. MC68HC908AB32 / MC68HC908AZ32A / MC68HC908AZ60 / MC68HC908AZ60A / MC68HC908AS60 / MC68HC908AS60 with Auto Security added to Model5000. IS93C46D / R1LV0408DSP / TC58FVM7B2ATG/TC58FVM7T2ATG/TC58FVM7T5BTG/TC58FVM7B5BTG(TSOP56) are added to Model5000. HD64F2237F / HD64F2238F /HD64F2239F / HD64F2258F are added to Model5000. AK6508C/AK6010/AK6012/LST28004/LST28001 are added to Model2000+. S-93S46A/56A/66A , AT90S2333/LS2333 are added to Model2000+/5000. 74LS592/HC592 is added to the digital tester. PIC16F1509/07(All PIC16F917 based Algorithm) Programming Speed is optimzed in Model 5000 (2-4 times faster). HexEditor window diappearing bug at startup in some windows is removed. LPC2138-2148 Chip size is corrected. Где все это реализовано и не только. 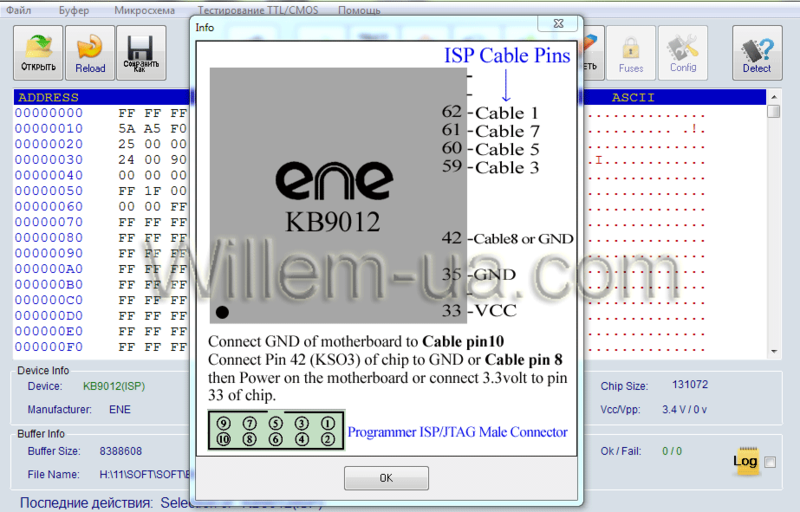 ENE KB9012 Laptop motherboard keyboard controller chip is added to Model5000. Rensas HD64F2239F(ISP) is added to Model5000. KS24C020,KS24A1281,KS24A2561,KS020,S24VP02/04/16,S93VP462/463662/663 are added to Model2000+. Рабочие прошивки на MIO KB9012QF , на многие модели ноутбуков, можно скачать с нашего Файло-Обменика. Motorola / FreeScale MC68HC11KA4 / MC68HC11A8 are added to Model5000. MC68HC908 series OTP fuse added to Model 5000. M24M01 / M24M02 / M34D64 / AT49F8011 / AK93C75 / AK93C85 are added to Model2000+. PIC16LF1902 / PIC16LF1903 / PIC16LF1904 / PIC16LF1906 / PIC 16LF1907 / PIC16F1516 / PIC16F1512 / PIC16F1513 / PIC16F1516 / PIC16F1517 / PIC16F1518 / PIC16F1519 / PIC16F1526 / PIC16F1527 / PIC16LF1512 / PIC16LF1513 / PIC16LF1516 / PIC16LF1517 / PIC16LF1518 / PIC16LF1519 / PIC16LF1526 / PIC16LF1527 are added to Model 2000+/ Model 5000. M95512 / M95512R / M95512W / CXK582000 / V29LC51000 / V29LC51001 / V29LC51002 / V29C51400T / V29C51400B / V39C31004T / V39C31004B are added to Model 2000+/ Model 5000. PIC16F716 Optimized for Speed & errors in all Models. AM29F160DB / AM29F160DT(TSOP48) are added to Model2000+. Скачать сотф Version 9.08 (Dec 16,2013) для программатора TNM 2000 и TNM 5000 , можно на нашем сайте здесь. Ищите ниже микросхемы, которые просили добавить в поддержку. Renesas R8C/36A Series R5F2136C , R5F21364A / R5F21364C / R5F21364M , R5F21365A / R5F21365C / R5F21365M , R5F21366A / R5F21366C / R5F21366M , R5F21367A / R5F21367C / R5F21367M , R5F21368A / R5F21368C / R5F21368M / R5F21368F / R5F21368H / R5F21368X / R5F21368Y / R5F21368Z / R5F21368W , R5F2136AA / R5F2136AC / R5F2136AM / R5F2136AF / R5F2136AH / R5F2136AX / R5F2136AY / R5F2136AZ / R5F2136AW , R5F2136CA / R5F2136CC / R5F2136CM / R5F2136CF / R5F2136CH / R5F2136CX / R5F2136CY / R5F2136CZ / R5F2136CW are added to Model5000. Renesas R8C/33C Series R5F21331A / R5F21331C / R5F21331D / R5F21331M , R5F21332A / R5F21332C / R5F21332D / R5F21332M , R5F21334A / R5F21334C / R5F21334D / R5F21334M , R5F21336A / R5F21336C / R5F21336D / R5F21336M are added to Model5000. Renesas M16C/62 Series M3062CF8 , M30622F8P , M30623F8P , M30620FCP , M30621FCP , M3062AFC , M3062BFC , M3062LFGP , M30625FGP, M30626FHP, M30627FHP, M3062JFH , M30626FJP , M30627FJP are added to Model5000. Motorola / FreeScale MC68HC11E20 is added to Model5000. PIC24FJ256GB106/ PIC24FJ256GB108 / PIC18F66J93 / PIC24FJ256GB110 / PIC18F67J93 / PIC18F86J72 / PIC18F86J93 / PIC18F87J72 / PIC18F87J93 are added to Model 2000+/ Model 5000. DS1285 / X24001 / X24012 / X24022 / X24042 / X24325 / X24022 / X24164 / X24165 / X24321AH / X24320AH / X24320AG / X24320 / X24640 / X24641 /X24645 / X25164 / X25165 / X25168 / X25169 / X25324 / X25328 / X25329 / W78E052C / W78E051D / W78E054D / W78E052D / W77E532A are added to Model2000+. Скачать сотф Version 9.09 (Jan 6 , 2014) для программатора TNM 2000 и TNM 5000 , можно на нашем сайте здесь. В том числе и "прицельными" на конкретные ис (по запросу). В данной версии появилась поддержка ис Motorola. Автоспециалисты , чип тюнеры, автоэлектрики, очень просили. Infineon Tricore family Audo-NG (Next Generation) TC1796 TC1766 with support of External 32-bit Flash ( S29CD032 - S29CD016 ) in new Bosch ECUs are added to Model5000. Motorola MPC562 MPC561 BDM programming for External Flash & External EEPROM in EDC ECUs (Bosch & Sim2K)are added to Model5000. Motorola HC9S12DG64 / HC9S12DG128 / HC9S12DG256 / HC9S12DG512 series with security bypass feature are added to Model5000. A49LF040TL Auto detect is added to all Models. New AutoISP clock Speed Adaptaion system for all AVR ISP in Model5000/2000+ & Reset Idle State for ATXMEGA series. Renesas R5F21226 / R5F21227 / R5F21228 / R5F2122A / R5F2122C / R5F21236 / R5F21237 / R5F21238 / R5F2123A / R5F2123C are added to Model5000. Flash memories: Samsung KM29N040T, mitsubishi M5M29KT641AV are added to Model5000. Nand flash: TC58NVG0S3ETA0B / TC58NVM9S3ETA00 / TC58NVG3S0FTAI0 are added to NandProgrammer for TNM5000. ATMEL AT89C51CC01 / AT89C51CC03 / AT89C51AC3 / AT89C51IC2 / AT89C51ID2 PLCC44/TQFP44 are added to Model 5000. Asus Bios CAP file format added to all Models. POLSKI language is added to All Models. Скачать софт Version 9.11 (Apr 4 , 2014) для программатора TNM 2000 и TNM 5000 , можно здесь. LH28F160/320 Block unlock corrected & lockdown fuse is added in All models. C8051F300 / C8051F301 / C8051F302 / C8051F303 / C8051F304 / C8051F305 are added to Model5000. TC58DVG02A3TA00 is added to Model2000+ / Model5000 . Скачать софт Version 9.13 (May 4 , 2014) для программатора TNM 2000 и TNM 5000 , можно здесь. По запросу добавлены некоторые ис, пользователя BanLadan . Тема для запросов поддержку здесь. SAK-C167CS-M95080 / UPD78F0511A / M30873FH / M30875FH / M30876FJ / M30878FJ / M30879FK / M3087BFK / ST10F272 / LH28F128BFHED-PWTLZ8 / M58LW032A / JS28F640D are added to Model5000. Скачать софт Version 9.15 (May 28 , 2014) для программатора TNM 2000 и TNM 5000 , можно здесь. Прям подарок мне на день рождение! Спасибо. По делу. Снова добавили микросхемы, и в этот раз, снова по нашему запросу. M58LW032C is added to Model5000. EEPROM only read & write is added to Atxmega Series. 72F321AR9T / 72F324J2B / 72F324J2T / 72F324J4B / 72F324J4T / 72F324J6B / 72F324J6T / 72F324J6T6 / 72F324K2B / 72F324K2B /72F324K4B / 72F324K4T / 72F324K6T are added to Model5000. DSPIC33F write Speed optimization (Bypass empty FF bytes). Скачать софт Version 9.16 (June 12 , 2014) для программатора TNM 2000 и TNM 5000 , можно здесь. HT48R05A / HT48R06A / HT48R50A-1 / HT48R01A are added to Model5000. A29040,A290021,HY29F040A unprotect sector is added to Model5000/2000. Скачать софт Version 9.21 (June 21 , 2014) для программатора TNM 2000 и TNM 5000 , можно здесь. H27UCG8T2BTR / 29F64G08CBABA / TH58NVG5D4CTG20 are added to Model 5000. DS1387 SRAM & RTC is added to Model 5000. W25Q40BW / W25Q20BW /W25Q16BW are added to Model 2000+. SAMSUNG S3F8285 / S3F8289 / S3F828B are added to Model 5000. HOLTEK HT46R52A / HT46R51A are added to Model 5000. W78E065A is added to Model2000+. Winbond W79E821 / W79E821A / W79E822 / W79E822A / W79E822B / W79E823 / W79E823A / W79E823B / W79E824 / W79E824A / W79E825 / W79E825A are added to Model 5000. Renesas M3087xx Flash Base Address Bug is removed in Model5000. 7440102 / 7440103 / 74HC40102 / 74HC40103 are added to the Digital Tester. HT 46r47 / LH28F128 будут добавлены для следующей версии (1-2 недель). Для Nand BGA - пожалуйста, сообщите какие именно нанды флеши нужны в корпусах бжа в первую очередь, тип корпуса. Для MSP430F1232 - работы по поддержке данной ис ведутся. Но пока нет результата. Может занять время & не в краткосрочном периоде. TC58NVG0S3ETA00 is added to Model2000+ / Model5000 (Nand Programmer ver 5.87). SAMSUNG S3F833B / S3F834B are added to Model5000. HOLTEK HT46R47 is added to Model5000. LH28F128BFHT-PBTL75A TSOP56 is added to Model 5000. Nuvoton N79E821 / N79E821A / N79E822 / N79E822A / N79E822B / N79E823 / N79E823A / N79E823B / N79E824 / N79E824A / N79E825 / N79E825A are added to Model 5000. Не успеваю я за выходом обновлений на данный аппарат. сразу два охвачу...но доступным сделаю к закачке последнюю версию. ST ARM Cortex M3/M4 Series are added to Model 5000. PIC18F97J60 algorithm identification Bug from version 9.25 is removed. MX25L25635F /MX25L25636E / MX25L51245G are added to Model5000/2000+. are added to Model 5000. TC58NVG6D2GTA00 / TC58NVG7T2HTA20 / TH58NVG5S0FTA20 / TH58NVG5S0FTA20 are added to Model5000 (Nand Programmer ver 5.87). Motorola MC68HC912D60A / MC68HC912D60AVFU8 / MC68HC912D60AVPV8 / MC68HC912D60CVFU / MC68HC912D60CVPV are Added to Model5000. PIC24FV16KA301 / PIC24FV16KA302 / PIC24FV16KA304 / PIC24FV32KA301 / PIC24FV32KA302 / PIC24FV32KA304 are Added to Model5000 / Model2000+. PIC32MX mismatch device id is corrected. Ramtron FM30C256, FM24C04-FM24C64 are added to Model5000. JS28F160C3B / JS28F160C3T / JS28F320C3B / JS28F320C3T / JS28F800C3B / JS28F800C3T are added to Model5000. MC9S12XD128CAA / MC9S12XD128CAL / MC9S12XD128CFU / MC9S12XD128CPV / MC9S12XD128MAA / MC9S12XD128MAL / MC9S12XD128MFU / MC9S12XD128MPV / MC9S12XD128VAA / MC9S12XD128VAL are added to Model5000. ARM STM32F103RC / STM32F103RD / STM32F103RE / STM32F103VC / STM32F103VD / STM32F103VE / STM32F103ZC / STM32F103ZD /STM32F103ZE are added to Model5000. AT49LL020(PLCC32) / AT49LL020(TSOP40) / AT49LL040(PLCC32) / AT49LL040(TSOP40) / AT49LL080(PLCC32) / AT49LL080(TSOP40) are added to Model5000/2000+. IC 4538 is added to Digital tester of all Models. W78E62B is added to Model2000. TC58NVG0S3ETA00 id Bug in Model 2000+ is removed. Motorola Srecord File format *.S19 is added to software.